Went to her new home on Monday 6th November 2017 . Lottie is a small black ex-racing greyhound who was born on the 10th May 2014. She's a quiet girl who weighs about 26.1 kg, is spayed, house trained, inoculated and microchipped. Lottie's racing career came to an end when she pulled a tendon in her back left leg. This doesn't stop her enjoying life and will hop at times when out and about, however we've been told with rest she should be okay. She walks lovely on a lead, is okay with children and generally okay with other dogs although she will have a growl and a grumble when she first meets them - something we've been told she has done since being a puppy. Lottie is a super girl and travels well in a car. This morning Lottie went off to the vets to be spayed. She weighed in at 26.1 kg and her health check said she was fit and well apart from her back leg where she'd pulled a tendon and it hadn't had chance to heal properly. Her spay went well and later in the afternoon we brought her home and put her in one of the living room crates where she could rest and recover. Lottie slept well last night and gave us a lovely greeting when we let her out to do her toilet in the garden. Vince who is one of our registered volunteers asked if he could foster for us a short time ago. This afternoon he called in with his daughter Maya to collect Lottie and all her belongings to take her home with them. Here she will stay until we can find Lottie her forever home. Vince's home is much quieter (dog wise) than ours with a much smaller garden so this should help her leg heal much better as she's not being pushed around by the others and doesn't have the space to run around and over do her leg. 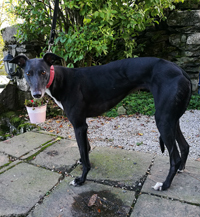 This afternoon Lottie went off to her new home where we hope she will have a long and happy life. Although Lottie is a lovely name she is now being called Lucy. This is because a member of the family is deaf and struggles to say Lottie with there being t's in it. Lucy she can say fine so Lucy she is now being called. Although Lucy hops on hard ground rather than walk on four legs we all believed it to be her injury not yet healed. However, a few days after she went to her new home she went to the vets for her spaying stitches to be removed and the vet spotted a corn on one of the pads on the side she hurt herself. Her injury had healed fine, it was the corn that was making her hop. Her new owners are now filing the corn down to the level of her pad and applying duck tape to kill the corn and pull it out.